My wife and children surprised me last week with a fantastic geek find. 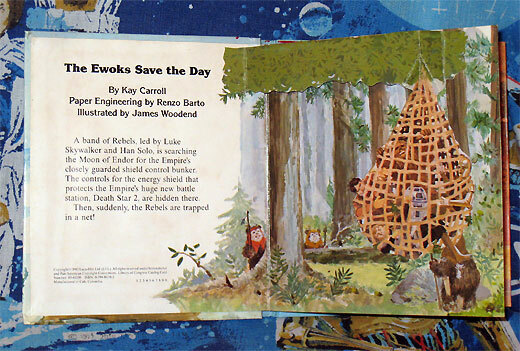 While perusing a collection of used books, they found a cute little Return of the Jedi tie-in book entitled The Ewoks Save the Day. 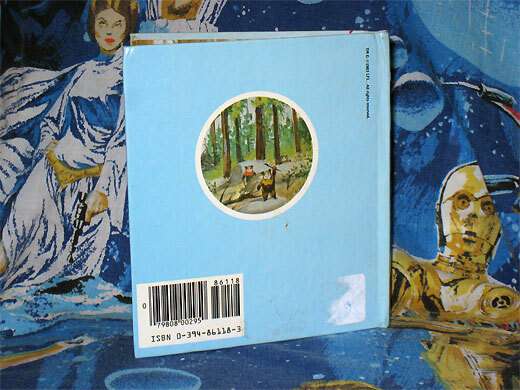 This is a pop-up book that was produced in 1983. It’s super fun and super cute. Here are some photos of the book. These photos don’t cover every page, but they do cover the better ones. And yes, those are my original 1977 Star Wars bed sheets in the background! My step-son sleeps on them nowadays. Makes me proud. It may be difficult to tell, but the hanging net above actually swings across the page as you open the book. Very cool! I love how the book refers to the second Death Star throughout as “Death Star 2″. Makes me want to say, “Death Star 2: Electric Boogaloo” in honor of Chocotaco. The pop-up engineering above is pretty neat. 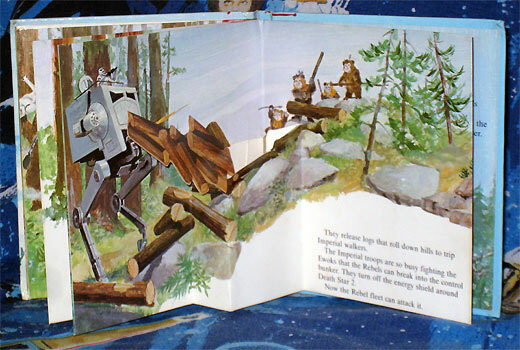 As you open the page, the logs come up and then settle near the AT-ST’s feet. Very nice way to capture the spirit of the film. 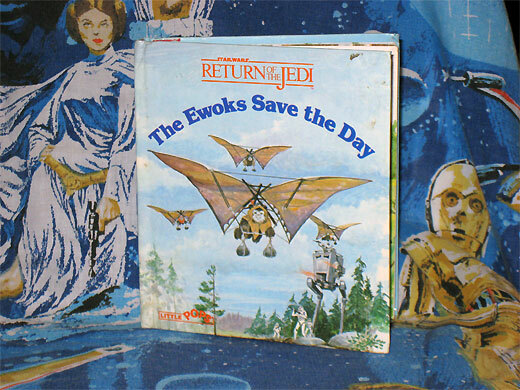 Cute book, but if you’re like me you can’t help wondering, “Was it better than the TV movies The Ewok Adventure and Ewoks: The Battle for Endor?” And if you’re like me… then I feel pity for you that a question like that actually crossed your mind. 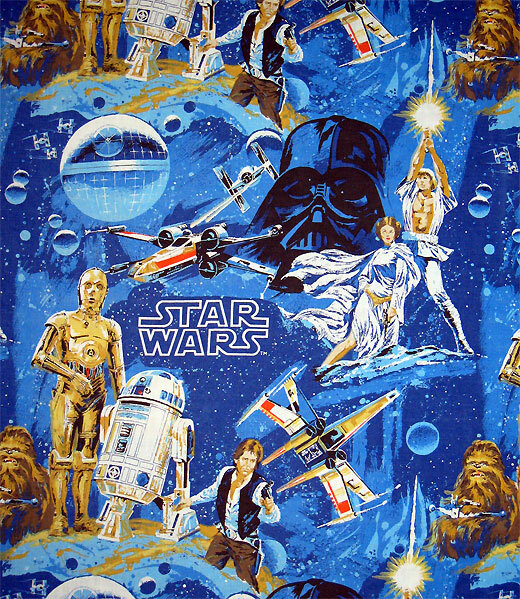 Here is a shot of the pattern on my 1977 Star Wars bed sheets. In college, my roommate and I used these sheets to cover our ugly couch. I tried that with my wife, but it didn’t work out so well. She made me go and buy a new couch instead. Death Star II: Electric Boogaloo? Word! 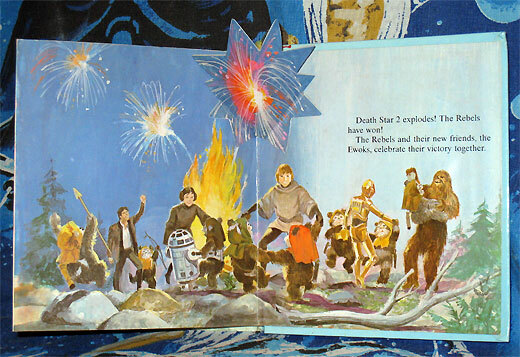 You know that the Ewoks were bustin’ out some pop-and-lock action at that victory celebration, while C3PO and R2-D2 were doing the robot. I’m now thinking about what an Ewok/Wookiee hybrid would look like; so, thanks for that. Awesome find! Last year at a community yard sale I picked up a complete Wicket the Ewok game (http://www.boardgamegeek.com/boardgame/4904/wicket-the-ewok), which I had never seen before, for a buck. Definitely looking forward to breaking that one out with my son when he gets a little bit older. 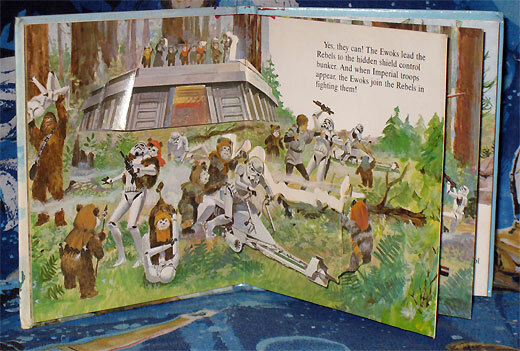 I remember an old 90s cartoons featuring the Ewoks and their adventures in their planet, Endor. A wookie and ewoks hybrid? Hmmm, it’ll be an extra furry 3 feet creature that can snap your spine as if they were twigs. The sheets are really good to see-my Dad was the art director for the company that designed them and created all of the Star Wars bedding from the 70’s and early 80’s. This one was my personal favorite-he used a really excellent illustrator and muralist named Harry Shaw for the artwork. My dad had so many Star Wars stories to tell-Lucasfilm was really hands-on at the time and allowed him to sketch the sets for Empire, and meet the half-designed Yoda puppet. I was about 11 or 12 and it was a big deal for my brother and me. Great to see you holding on to the stuff we loved so much!